More than anything, Memorial Day celebrations mean that barbecue grills all over the country will be seeing some action as families and friends get together to grill, eat, drink and be merry. I, however, will not be grilling this weekend but will instead, find some time to just chill out and watch a couple of newly released DVDs with a nice ice cold beer and some chips and salsa. 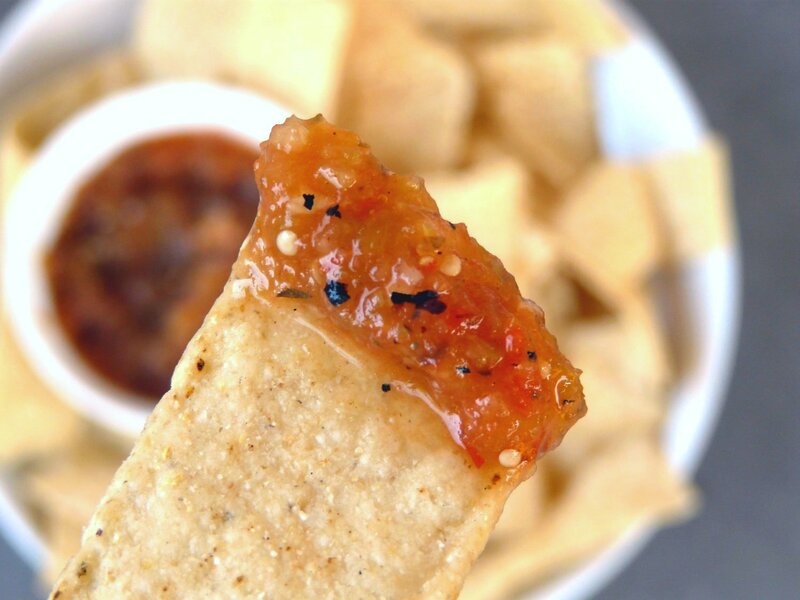 I made this salsa a couple of days ago because I had some forlorn looking tomatoes and tomatillos sitting in the fridge in dire need of some good lovin'. So I tossed them onto the grill and barbecued them until their skins were kind of blackened, then gave them a whirl in the food processor along with a Jalapeno pepper, garlic, onion, lime juice and seasonings. Now transformed into smoky and spicy salsa, they will be completely adored tomorrow when I enjoy them with some crunchy corn chips during my movie sessions. Makes about 2 to 3 cups. 6 to 7 medium tomatoes, leave whole. 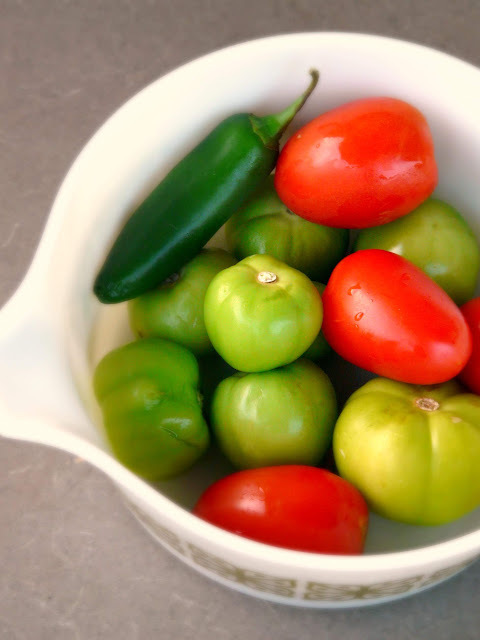 You can use just tomatoes or a combination of tomatoes and tomatillos as I did. Fire up the grill and lightly brush some oil onto the grate. Lay the tomatoes and Jalapeno pepper in the center. 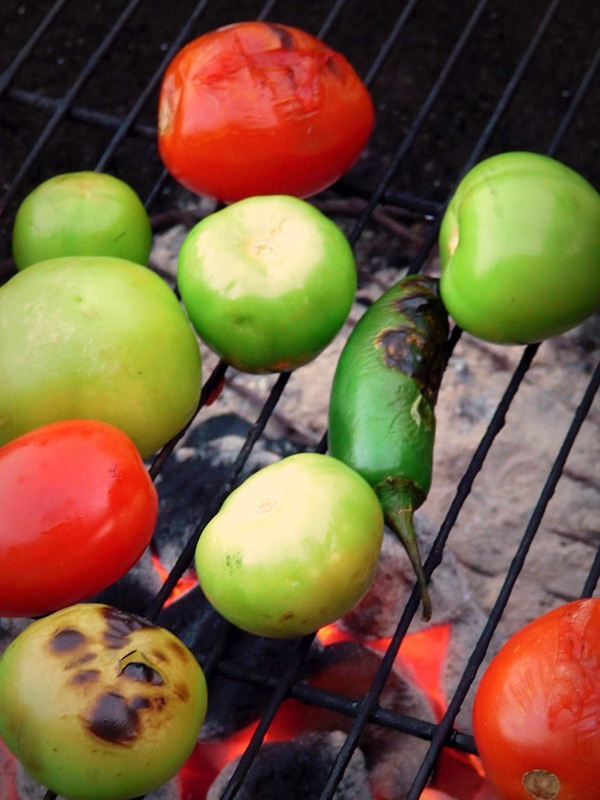 Close the grill lid and cook the tomatoes and pepper for about 10 to 15 minutes, opening it occasionally to check on them and to turn them over so they get charred evenly. If you'd like to also grill the onion, feel free to do so as grilling it will remove some of it's pungency and add sweetness to the salsa. 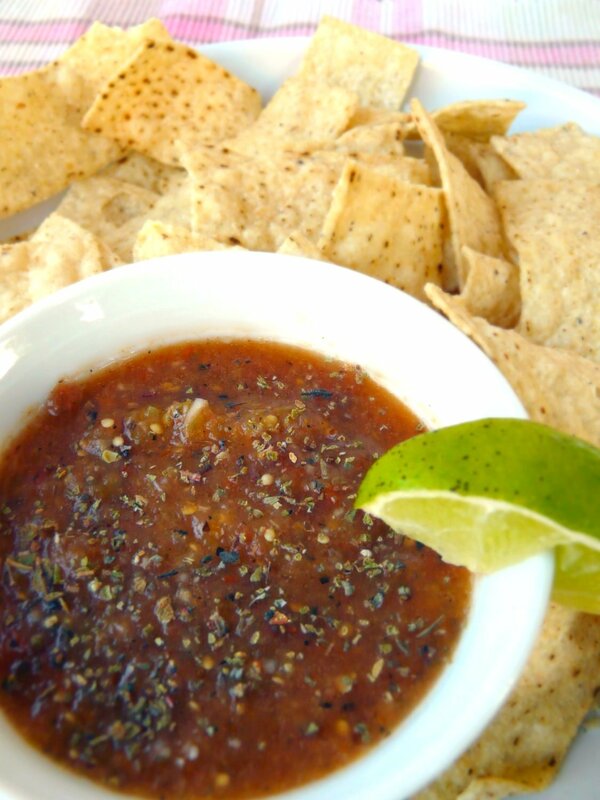 I prefer a more potent, raw onion taste in my salsa so I chose not to grill it. Once the pepper and tomatoes have softened and have charred skins, remove them from the grill and transfer to a plate. Remove the stem from the Jalapeno pepper and make a long vertical slit down the center to open it up. Cut out the seeds of the pepper and discard them. Place the tomatoes and seedless pepper in a food processor along with the onion, garlic, oregano, cilantro and lime juice. Pulse several times until all the ingredients have been blended together. Add salt and a pinch of sugar to taste. 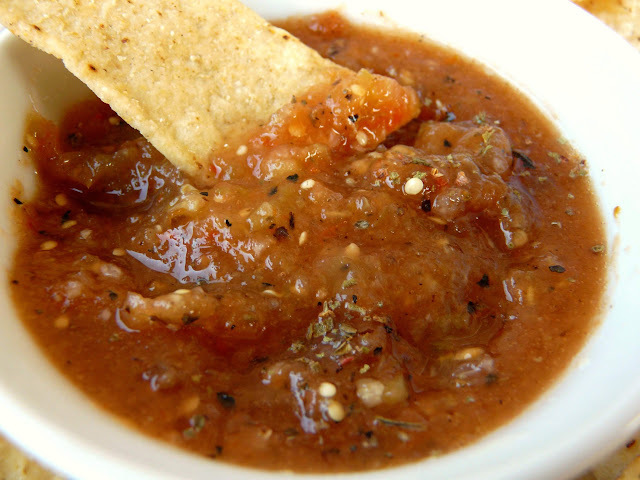 Chill the salsa in the refrigerator for at least an hour before serving.